When thinking of “The Nutcracker,” many would only recall the classic Tchaikovsky ballet. And while there is some lovely ballet performed in Disney’s The Nutcracker and the Four Realms (performed by the amazing legend Misty Copeland), it is worth noting that the story is a little different, inspired instead on the original 1816 story “The Nutcracker and the Mouse King” by E.T.A. Hoffman. I recently saw the film at the world premiere in Hollywood, and I am excited to now get to share my spoiler-free The Nutcracker and the Four Realms review! Mackenzie Foy is Clara, Keira Knightley is Sugar Plum Fairy, Jaden Fowara-Knight is Phillip, Eugenio Derbez is Hawthorne and Richard E. Grant is Shiver in Disney’s THE NUTCRACKER AND THE FOUR REALMS. From the very moment the film begins, you can’t help but instantly be in awe of the stunning visuals. The sets (many of them real sets and practical effects, not solely CGI) are dazzling, and it is incredibly exciting to see how the scenery changes from scene-to-scene. From the mansion where Clara is enjoying a holiday party, to the Realm of Snowflakes, Realm of Flowers, Realm of Sweets, and the Fourth Realm, each is very unique, enchanting, and intricate. Also exquisite are the breath-taking costumes, hair, and make-up! 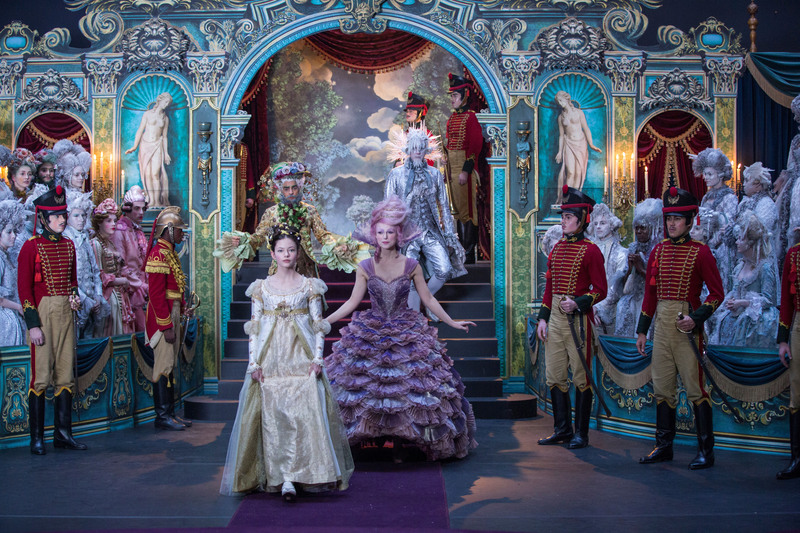 From the purple party dress Clara (Mackenzie Foy) wears in the opening scene, to the over-the-top Sugarplum Fairy costume and wig, it was wonderful to see such beautiful costuming in Disney’s The Nutcracker and the Four Realms. Mackenzie Foy portrays Clara perfectly. I have seen The Nutcracker ballet every year for as long as I can remember, and Foy portrays the kind, brave, and curious Clara true to the character we all know and love! Famed ballet dancer Misty Copeland plays the Ballerina, who serves as the narrator of the story, narrating through dancing, rather than speaking. I loved that they incorporated ballet into the film, even though its source material comes primarily from the original book. When Copeland begins her performance on-screen, you can’t help but become in awe of her stage presence and passion in ballet. She beautifully tells the story of the Four Realms through movement, showing how effective dance can be in storytelling. Misty Copeland is the Ballerina Princess in Disney’s THE NUTCRACKER AND THE FOUR REALMS. Keira Knightley plays Sugarplum Fairy, who is from the Realm of Sweets. I am used to seeing Knightley play the same types of characters, and was pleasantly surprised to get to see her do more of a character-acting role! I had never seen her portray a character like Sugarplum, and it was exciting to see Knightley nail this role to a tee! Sugarplum is full of surprises, and one of my favorite parts of the film. Keira Knightley is Sugar Plum in Disney’s THE NUTCRACKER AND THE FOUR REALMS. Celebrate Mickey Mouse with Mickey’s 90th Spectacular Special on ABC!